A festive luxury bouquet of red and coral roses. 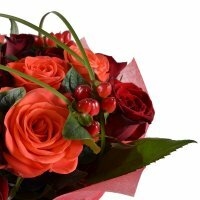 No other flower is likely to compete in beauty With this queen of flowers! 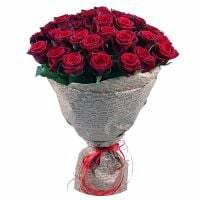 This wonderful present is meant for a beautiful woman - a wife or a beloved one. 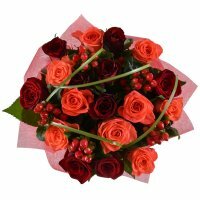 Red roses are expressive to speak about love while coral roses admire her and wish her happiness. 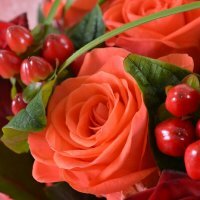 A festive-looking decoration made of hypericum berries and bergrass greenery adds femininity and playfulness to the composition. 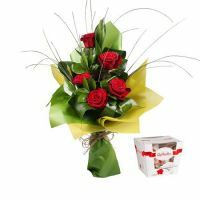 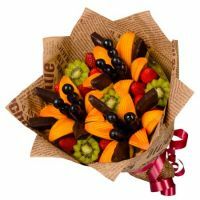 Such a gift is sure to make a birthday party, wedding anniversary or a any lady's holiday still brighter and more solemn! 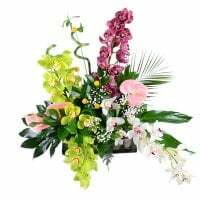 Design of a bouquet may differ from the one presented on the site. 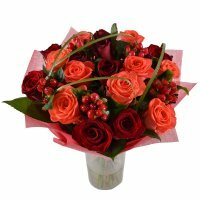 The vase is not included into the price of the bouquet.